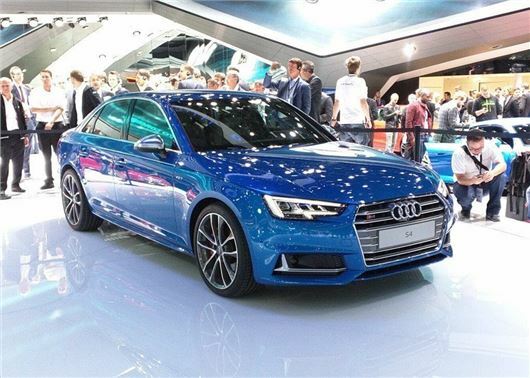 Audi has officially launched the all-new A4 at the Frankfurt Motor Show, with new engines and less weight. The new A4 will return up to 74mpg and emit less than 100g/km of CO2, with prices starting from £25,900. The new A4 will reach UK showrooms in December 2015. The new A4 is longer and wider than the outgoing car, with more head and legroom in the cabin. Available in saloon and Avant bodystyles, the A4 will provide as much as 1510 litres of bootspace with the rear seats down; however, daily running costs are significantly lower, with more Ultra models available with low rolling resistance tyres and smaller wheel sizes. From launch there will be seven engines – three petrol and four diesels, with the most cost effective powertrain being the 150PS 2.0-litre TDI Ultra that will return an impressive 74.3mpg and emit 99g/km of CO2. For performance seekers, there will also be S badged models, with a 3.0-litre V6 petrol engine with 354PS and 500Nm of torque, equating to a 0-62mph in 4.7 seconds. However, as you might expect, S4 models won't return anywhere near the headline economy figures, with fuel economy at a claimed 38.2mpg and emissions at 170g/km of CO2. Standard equipment has been improved across the range, with three-zone climate control, Audi Drive Select, 17-inch alloy wheels and a seven-inch infotainment system with full smartphone compatibility. Optional extras include traffic jam assist, rear cross traffic assist, collision avoidance assist and a whole lot more assistance systems to make driving easier and safer.